Silent Sun Temple of Modhera emits red and golden hues from every corner and illuminates the quaintness January nights during the Modhera Dance Festival. The epic masterpiece of Solanki Empire, Modhera Sun Temple, reverberates with the rhythmic beats of prancing steps during the festival. Dance and musical events organized during the festival celebrates the uniqueness of dance and art of this part of the area. Modhera Dance Festival brings together brilliant dancers and musicals to perform an amazing musical, intermingled with their origin. 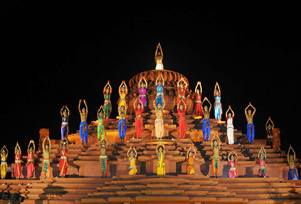 Bharat Natyam, Kuchipudi, Kathak are amongst the various dance forms that are shown at the festival. Grand space of the peerless Modhera Sun Temple serves as a grand backdrop of the vibrant expression of dancers. To revive year's old traditions and respect to the rich cultural legacy of the past, Modhera Dance Festival is revered with fanfare. For those who want to witness and conjure up the rich legacy of the past should be a part of the Modhera Dance Festival.